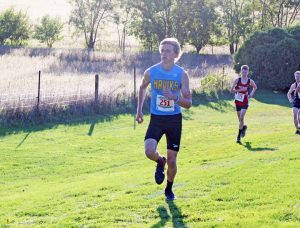 The Hawks cross-country team had an opportunity to show the conference and community what they have been preparing for all season at the 2017 SICL Conference Meet on Thursday, Oct. 12. “Each year, our conference meet is one we highlight on our schedule, one we prepare for all season and make as our goal to have individual all-conference performers and as a team compete for top finishes,” said L-S Head Coach Darin Arkema. L-S traveled to Colfax for the big meet, competing on a course they ran on earlier in the season, to face conference schools and exhibit the improvement they have made throughout the season. The girls were one point short of first place, and the boys ran tough races. 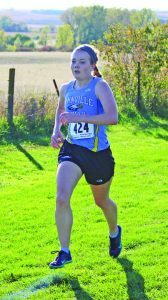 Shaver pushes herself to a third-place finish at the SICL Meet. “We had strong performances from all our girls tonight, several of them significantly faster tonight than on this course in September,” commented Arkema. 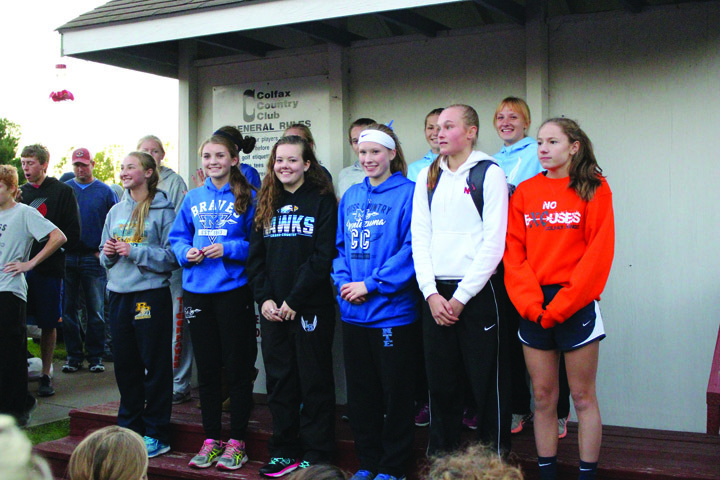 Three girls found their way into the top 10, earning all-conference honors. Senior Mary Kate Shaver was the third runner to cross the finish line with a time of 22:10. Behind her in seventh was sophomore Abby Gruver, and in eighth was freshman Megan Van Zante. The two raced to the very end, both clocking in at 23:20. The fourth runner for the Hawks, senior Christine Nikkel, earned 19th in 25:20. Junior Emily Van Gorp ran the race in 25:38 and placed 22nd. Abigail Davis, a sophomore, came in 24th at 25:52, followed by senior Haley Breeden in 26:01, placing 26th. JV runners for the Hawks were senior Jataya Meyer (second, 26:26), senior Hailey Scandridge (third, 26:27), sophomore Brittney Hansen (fifth, 27:02), and freshman Hadley Tice (eighth, 27:48). Colfax-Mingo took the conference championship with 50 points, and L-S was just one point behind them. Senior Josh Dunsbergen runs a solid race at Colfax, earning himself honorable mention in the SICL Conference last Thursday, Oct. 12. The boys placed sixth as a team with 112 points. Belle Plaine earned the conference title with 46 points. L-S was led by senior Josh Dunsbergen, placing 12th and earning all-conference honorable mention with a time of 19:22, almost a minute faster than his race there earlier in the year. Junior Joseph Anderson and freshman Mason Jansen battled until the end, Anderson earning 20th in 20:38 and Jansen placing 21st in 20:39. Behind them was sophomore Blaize Kuhlmann in 35th, clocking in at 21:46. Freshman Luke Kramer was the fifth and final runner for the Hawks, finishing the race in 24:10 and placing 50th. Kramer made a two-minute improvement from his race earlier in the season. Junior high also competed at Colfax, running a 1.5-mile loop. Four runners placed in the top 10, including James Gruver, who placed first with a time of 11:28. Gruver earned first earlier this year at Colfax and proved himself once again at the conference meet. Gentry Walston wasn’t far behind in seventh (12:21). Just short of tenth, in 11th, was Josh Hardenbrook (13:02). Three more runners for the boys, Ryan Annee (15th, 14:11), Zachary Morningstar (16th, 14:21), and Evan Fikse (26th, 16:05) all ran excellent races. The junior high boys had the top team score at the meet. In the junior high girls race, Greenlee Smock earned eighth, clocking in at 13:47. Kinsley Tice snuck her way into the top 10, earning 10th with a time of 14:04. Reagan McFarland improved her time by 24 seconds and placed 17th in 14:52. The junior high is scheduled to finish their season at the Washburn Classic State Junior High meet on Saturday at Ankeny Centennial. The high school team will compete in the state-qualifying meet hosted by Pekin in Ottumwa this Thursday, Oct 19. The top three teams and top 15 individuals in both the boys and girls races will qualify for state in Fort Dodge on Oct. 28.